Bring a basket if you think it's your lucky day. Forage at night and you will be all alone when you stumble upon a bonanza. If you're hungry, put a pan on the fire and bask in the aroma of chanterelles as you saute them in butter. Feeling mercantile? Sell porcini to local aficionados for information that will help you find what you seek deep in the forest. A look at the game, components and how to play, as well as final thoughts. I think that Morels has some wonderful artwork. I loved the art for the various mushrooms, and the day and night cards have a wonderful feel to them. And like Rodiek mentioned in his review you can order hand crafted stick and pans to play the game. What do you do with these handcrafted sticks and pans you ask? Well you try to make as many matching mushrooms as you can. For example 4 porcini mushrooms. Each type of mushroom has a value so your decision making could be based on cooking only groups of valuable mushrooms. 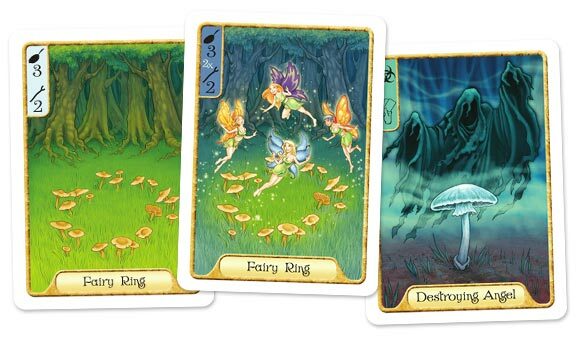 In the game Morels you have several choices you can make each turn. It could be called a gateway “choice” game. The game starts by you laying out a certain number of cards in a row. Each turn some of these cards will go into a decay pile. When the stack of cards has been gone through the game ends. During your turn you can pick up cards that are “at your feet” in other words at the end of the line ready to go into the decay pile. But what if you don’t want the mushrooms that are at your feet? You want the mushroom that is 4 cards up from your feet. That is where the sticks come in. You can sell a group of two matching mushrooms to purchase sticks. Each stick allows you to move one card up. One stick and you can pick up the third card from the end. Two sticks and you can pick up the fourth card from the end etc. So on your turn you can pick up a mushroom, make a purchase of sticks, cook your mushroom (turn them into points) pick up all the cards in the decay pile, or place down a pan card. A pan card? Well in order to turn your mushrooms into points you are going to have to cook them in a pan. Your mushrooms can also have points added to them by cooking them in butter or vinegar. Back to the beautiful cards, there are day cards and night cards. If you pick up a card that has a moon on the back the mushroom is worth more, making night time picking seem like an excellent idea. Until you meet the destroying angel which makes you discard cards and stay keeps you with a low card hand for a number of turns. There are also baskets in the game that allow you to have a larger than normal card hand. That’s right this game has a limit of how many cards you can have in your hand. That decay pile looks great and has one of the cards in it you need! But picking up all three cards will put me over my hand limit….Oh no don’t decay until I can get my hand limit up – sigh too late the card is gone. I enjoyed the game a lot. This is a game of choices but can be played by ages 10 and up I would think. The concept of the night cards being worth more points may required some math from adults to children playing. The scariest card is the destroying angel which you can view above. 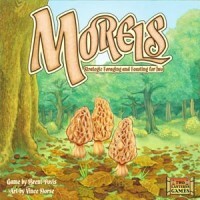 If you have about 30 minutes and want to play a fun family game with great art bring out morels. Just remember not all choices are as clear as night and day. Morels is a lovingly crafted and designed game through and through. Your first interaction with the game will be its colorful, almost storybook like art of the woods. Then, if you’re like me, you’ll see the awesome handcrafted wooden pieces because you paid a few bucks extra. Then, you’ll read the rules, which are concise, clear, and just playful enough to make it entertaining. The game is a quick walk through the woods. Every turn, more cards will pass into the “decay,” which means the game ends (when the deck empties). You take one action every turn and you never quite feel like you have enough actions to do everything. Should you cook? Grab that mushroom? Sell? Play a pan to stall? Gah! The game plays a little differently every time based on how defensively your opponent plays and the order of the cards. This is a light game, a quick game, but one full of variety and good, sound strategy. This has been very well received by my friends and I’m very glad to have it in my collection. If you enjoy 2 player games with a novel theme, give this a look. We love this game. This is one of our “go to” games when we have a 1/2 hour & wish to play a game. We pick it up at Origins & have played it almost every week. It is simple to learn, but hard to win. I do like that you can mess with the other player by taking their mushrooms before they can or just worry about yourself & getting the higher score. It is not my normal type of game (eruo), but I enjoy playing it alot. Add a Review for "Morels"